The Eastern chipmunk is a small ground squirrel. It has reddish-brown fur with a white belly and a white stripe, bordered by two black stripes, on each side. Eastern chipmunks grow up to 11 inches long. This animal lives in open woods, forest edges, and brushy areas. They dig burrows up to 10 feet long. Usually the main burrow has enlarged cavities for storing food. Inside the burrow, chipmunks will build a nest with leaves. The entrance to the burrow is a hole about two inches wide. 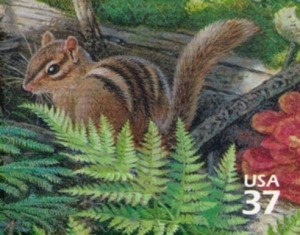 Eastern chipmunks breed in early spring. They only have one litter of three to five babies. Eastern chipmunks eat a wide variety of foods, especially acorns and nuts. Other foods they eat include: seeds, some plants, fruits, berries, slugs, snails, insects, baby birds, bird eggs, salamanders, small snakes, young mice, mushrooms, and carrion. Favorite nuts and seeds are from such plants as oaks, maples, American beech, sweetgum, black cherry, flowering dogwood, hickories, strawberries, buttercup, and weedy plants. Eastern chipmunks store large amounts of food (nuts and seeds) in their burrows. This is called a cache. Food caches are supposed to get the chipmunks through the winter. Chipmunks will spend much of their time running back and forth from trees to their burrows building their caches. These squirrels collect most of their food from the ground, but they will climb oak trees for acorns and shrubs for fruit. Eastern chipmunks hibernate, starting in late fall, but they wake every two weeks or so to eat from their cache. Chipmunks communicate with each other with chatter. They can also be heard chewing on nuts quite loudly. Predators of Eastern chipmunks include hawks, owls, red fox, raccoon, and house cats.